Jules' housewarming party was this weekend. After years wandering from one home to another, Jules has finally settled in a gorgeous 1950's home in Richardson, Texas. The house came with a Viking range -- an irony considering Jules is anti-kitchen. This is not to say that Jules is anti-food; she most certainly is not: she appreciate excellent food. She just doesn't enjoy the process of cooking. "It's like taking a beating," she tells me. She claims not to be able to boil water and goes into full-fledged Beaker panic mode when confronted with the idea of entertaining. After it became obvious that Jules was planning to gloss over the big move into her new home, I and several close friends browbeat her into hosting a housewarming party. Jules, notorious for finding such events stressful, consented only when I promised to fly in for the party and to cook. This was not completely altruistic; there was a Viking range to be enjoyed, after all. Twenty guests were expected over a three hour period and I decided that it was in our best interests to make relatively stress-free appetizers and dishes that could be rotated out easily. 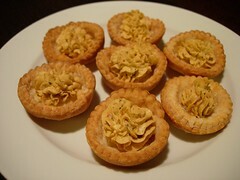 We settled on a rotini pasta salad tossed with pesto, a baked salmon in a honey-balsamic marinade, and several little appetizers: rosemary-gorgonzola gougères, baked Brie, crackers, baguettes rounds and cheeses, and these little sundried tomato pesto tarts. For sweets (because I can't resist any occasion in which we can produce four or five desserts!) we used more mini tarts and piped in chocolate mousse; pastry cream in puff pastry shells topped with raspberries, mini pain au chocolat, and chocolate dipped strawberries. These tarts were wildly easy - simply cream cheese beaten with a prepared sundried tomato pesto and then piped into blind baked pastry shells (made by cutting store-bought pastry and lining them in a mini-muffin tin) and topped with fresh rosemary from Jules' garden. Extra shells were used for the chocolate mousse -- making it a versatile appetizer and scrumptious sweet bite. I'm all about ease and bloodless entertaining. Plus, Jules could easily replicate this two-in-one combo for other occasions. Personally I'm convinced that she'll start enjoying the domesticated stuff more now that she has wonderful tools at her disposal -- a Viking gas range, a sunny kitchen, and a home meant for entertaining. In fact, I've already informed her that she will be hosting a Christmas tea party for her girlfriends -- and this time, no Beaker squealing or waving of the hands. I take this as a good sign. At first, Hubby was reluctant to try the foie gras. We were in the restaurant at Chatêau Sully, where we were staying while visiting Normandy. I eat foie gras like a fiend when I'm in France. It's readily available, superbly made and being a culinary patrimony, isn't widely regarded as evil. Sometimes, I feel guilty ordering it stateside. Whatever: I was there and I had a glistening round of foie gras and brioche in front of me with Calvados jelly. I proffered a bite. He looked at it unhappily, noting in low tones that he didn't like paté. "It's not paté," I told him. "It's foie gras." He took the morsel and bit down. He looked surprised. I understood: he was expecting the taste and texture of liverwurst (or worse). Instead, what he ate was a creamy, firm and seasoned bit of heaven. Washed down with sweet Sauternes, he was converted. I have a lobe of foie gras in my fridge and it is mocking me. I have no idea what to do with it. When Jamie offered it to me yesterday, I jumped at the chance thinking, I can sear it, I can make something. But the fact is, I think my ICDT problem just reared its ugly little head again. I leave tomorrow to go to Napa with Kellie. Whatever I do today is going to have to be quick. If I had time, ideally I'd love to try and make a torchon as described in The French Laundry Cookbook, but this is a four day process. For the last three years, I've read and re-read this chapter, hoping some day that I can muster up enough courage to try and make a torchon per Thomas Keller's instructions. Though Jamie gave me the lobe at his cost, it's still a good chunk of change. Unlike other kitchen adventures where disposal can be done somewhat easily, the idea of trashing any portion of the foie seems unnatural. I don't think I have the chops to pull this off. One of my favorite restaurants in Atlanta is The Food Studio. I've eaten there since it opened. I've mentioned before that I'm a huge fan of pastry chef Gary Scarborough's Lemon Basil Bombe. Their new American cuisine isn't "groundbreaking," per se, but it was in this restaurant that I first discovered cioppino; drank my first Viognier; and ate truffles for the first time. I used to eat there so frequently (ah the single life) that I became good friends with the staff, including the then chef de cuisine, David S. David has since departed, and I wish he hadn't, because during one of our conversations, David promised to teach me how to make a torchon. I no longer have a phone number to call to wail, "David! What do I do with the foie?" Jamie's preferred method of eating foie is to sear it. While I'm not opposed to eating foie this way, I'm much more partial to a torchon. The amazing Jocelyn at Kuidaore wrote about making foie à la Keller's recipe recently. When I say amazing, I mean it: she makes high end cooking look exquisite and deceptively simple. But we know it's not. So here I am with a beautiful lobe of foie and I haven't the foggiest what to do with it. I'm seriously intimidated here. Stephanie at Dispensing Happiness is having another Blog Party – this one focused on : Brunch. The friends have been so busy the last few weeks: weekly lunches and quick coffees together have been impeded by travel, work, family and other responsibilities; some time together to enjoy a respite from the daily grind, and to laugh together is in order. Brunch was scheduled for Saturday at 11, a time which makes it closer to lunch, but lunch implies something more structured, and structure is the last thing I want (or am) on a weekend. "You're having a brunch and flying out the same night?" Joetta asks during a phone call after I tell her I'm flying back to the UK that night. She's in Texas competing and so unable to join. She begins to laugh. "I can't tell if you're amazing or crazy." Definitely the latter. Let me describe the day: I stayed up until 3:00 Saturday morning in an OCD-inspired cleaning frenzy. When Hubby woke up at 7:00, I got up with him. Catching a glimpse of me bent over the sewing machine to make Annette's European pillow shams on his way out to the range, he muttered, "I see the sweat shop is open again." "Better than Elf Shop," I retorted. Elf Shop was what he named my one-woman, hand-made paper operation for our wedding. Two hundred and fifty invitations, all cut and assembled by hand, cutting board, hammer and grommets. That's another story. You see the recurring theme, yes? Madness. But there was a method to this: I was on my way back to Milton Keynes for a few days (once again, too short to do anything meaningful or meet up with friends [Keiko, I’m sorry!]). My overnight flight was scheduled to depart at 10:00 and I wanted to sleep; thus, I was priming myself to fall into an exhausted sleep beforehand. I finished the shams at nine and started cooking. There are two schools of brunch: savory brunches and sweet brunches. Guess what kind of student I am? But not everyone is as enamored of sweet dishes as I; so the menu included an equal number of savory and sweet dishes. And to drink: Raspberry Pomegranate Sparkling Lemonade. Sprawled in the living room, we form a semi-circle to talk and laugh. Eventually the desserts migrate to the coffee table and are consumed over coffee and tea. We may not have enough time; but what time we make together is infinitely precious. By the time Hubby gets in at 3:00, I have cleaned up and I have finished packing. We eat dinner together and I have a glass of wine to further mellow me. At 6:00, Greg and I are on the road. We make it fifteen minutes towards Atlanta when Delta calls to inform us that our flight has been cancelled and we will have to fly out Sunday evening instead. I feel cheated: I have worked so hard to be exhausted for my overnight flight! I was ready to sleep! I wonder if I should have a Sunday brunch, too? Among the many reasons to appreciate Jamie, my fish guy, is the fact that he will let me know when he has special items in and introduce me to new items in his pantry. A few weeks ago, when we had friends over for dinner, he produced ginormous scallops from the Gulf of Mexico that were succulent, juicy and unbelievably sweet. My in-laws were in town this past weekend (too short a trip Mom!) and Dad P. loves scallops so I went back to get some more. Unfortunately, he was out so he offered me smaller sea scallops from Florida instead. "They're not going to be as good as the ones from Mexico, but they're still sweet with good texture." As he was ringing up my order, he suddenly said, "Wait right here. I have something for you to try." Running in back, he came out with a box of what on first glance looked like dark green twigs. "These are sea asparagus," he said. I'd never heard of them. Two plants are called Samphire in France and England. One belongs to the Goosefoot family and is called Salicornia, of which a domestic U.S. version appears on the Pacific and Atlanta coasts. The other is Crithmum maritimum and called rock samphire or sea fennel. Perusing the web I found this: "The French called the plant perce-pierre (rock-piercer) and Saint-Pierre from Saint Peter, the rock which Christ built his church. Somewhere along the way, the names were corrupted, both in French and English, into sampier, sampyre, passe-pierre, pousse-pierre and samphire. For further confusion, it most likely was Salicornia stricta that was used in glass manufacture, not europea or herbacea, hence the name "glasswort." It was probably a good thing to refer to the vegetables as sea asparagus and not glasswort. I dunno about you but I wouldn't eat something called glasswort, would you? I quickly blanched the sea asparagus --no more than ten seconds to get it bright green, then shocked it in cold water. Jamie had warned me that sea asparagus is especially salty so I skipped seasoning, instead sauteeing it with a bit of butter and crushed garlic. The result? A superbly crisp and briny vegetable that was unusual and delicious. I can't wait to see what Jamie's got next. Stephanie at Dispensing Happiness is hosting another Blog Party! This month's theme is Vegas, Baby!. I love Vegas. Love Vegas. I didn't always: before I ever set foot in Vegas, I was convinced of its inferiority to my beloved "first rate" cities; I thumbed my nose at what I perceived to be the inherent tackiness of Vegas (Disneyland on steroids for adults?). I'm so glad ignorance can be rectified: who knew that after the first shocking night of my first (and thus far only) trip to Vegas, I would fall head over heels in love with this city? But how can you not love a city which appeals directly to a foodie? Four star restaurants all around. So what if there's a fake blue sky and singing gondoliers? I'm not the there to be amused; I'm there to eat. For this Blog Party, Cassandra is joining me since Hubby is out of town and we're bringing some high-rolling, high stakes dishes: Saffron Crisps, Grilled Lemongrass Beef and Onion Rolls, and Phyllo Cups with Seared Duck and Blueberry Cassis Reduction. And to wash it all down? A flute of crisp Sparkling Raspberry Lemonade because I can't hold my liquor. Wine, yes; hard stuff, no. But you should feel free to add a splash of Vodka. I can't wait to go back to Vegas. My next Vegas run isn't until the weekend before Valentine's Day with Hubby. We're already talking about where to eat. Sadly though, what happens in Vegas doesn't always stay in Vegas: the pounds and the hips definitely came back with me last time. I gotta figure out how to leave them behind this trip. It's that time again! Once again, Stephanie at Dispensing Happines is hosting a Blog Party. This month's theme: Big Game Night. Hubby and I have not, nor do we ever plan to, host a sporting event party at our house. To begin with, we lack the proper accoutrements: we don't have satellite dishes or monster, ginormous plasma screens with THX Surround Sound. Next, Hubby's teammates usually reserve the privilege of hosting such events years in advance. Then, there's a lack of team(s) to root for: our teams are seldom in the Big Game. Hubby grew up a Mets / Jets fan. Excepting one brief shining moment in the last few decades (the same moment that caused my Boston-Red-Sox-fan ex-boss to gasp in pain when I brought it up conversationally one day), I need say nothing more. I don't recall ever discussing the Jets before or during playoff season. There's the scar tissue and the trauma: I used to be a hockey fan. Or more specifically, a L.A. Kings fan. While I still have an incredibly soft spot for the team (I started watching when Rob Blake was a rookie! And when Wayne Gretzky first moved down from Edmonton! ), I don't love them any longer...nor do I love any team in any sport and this will never change. You might say I lack gumption. You might say I don't have the stomach to be a sports fan. You would be right. My heart was broken in Game 2 of the 1993 Stanley Cup finals. L.A. Kings vs Montreal Canadiens. With 1:45 left to play (not like I'm obsessed) in the third period and the Kings leading 2-1 (statistically, 80% of all Stanley Cup teams who win the first two games of the finals typically go on to sweep the series), Jacques Demers, the coach for the Candiens, instructed Guy Carbonneau to have referee Kerry Fraser check out LA defenseman Marty McSorley's stick. The stick was ruled illegal, McSorley was sent to the penalty box, Montreal pulled their goaltender, Patrick Roy for a 6-on-4 advantage. With 1:13 remaining (I'm not obsessed), Eric Desjardins scored for Montreal, sending the game into sudden death overtime. Fifty-one seconds later (am I obsessed? ), it was over. Desjardins scored again and the Canadiens proceeded to roll over the Kings for the remaining games in the series. (And no, it's not like I'm obsessed or anything, knowing the most miniscule details about this 4 minute cycle of hell). I comfort myself by remembering that however awful that moment was -- and there I was, standing slack jawed in disbelief in front of the TV -- it's nothing compared to what Chicago Cubs fans go through yearly (George Will claims that being a Cubs fan drove him to be a conservative), or what Buffalo, NY fans experience in two separate sports. And the final reason we're not likely to host a sporting event? I don't make hot wings and I forget hamburgers and hot dogs in the grill until they've reached instant-carcinogenic stage. Here are some favorite munchies for the Big Game in the comfort of your own home: Vanilla Port Poached Pear Pizzetas with Gorgonzola Cheese (one of the appetizers from our wedding), Wild Mushroom Pomponnettes, and "one bite" Pumpkin Cheesecakes. The Deep South is also where I encountered fried turkey for the first time. Fried turkey is exquisite. You never want oven baked turkey after you've had a fried turkey. Tender, juicy meat, crispy skin. Sadly, also responsible for 15 deaths and countless houses burning down last year. Apparently some people don't realize that it's best to fully thaw and dry the turkey before dropping it into a vat of oil (hot oil + water = huge owie). And dropping it in the vat of oil appears to be the other problem -- that is, some people haven't had the same "Eureka!" moment Archimedes had in his bath (the Archimedes principle states that an object immersed in a fluid experiences a buoyant force that is equal in magnitude to the force of gravity on the displaced fluid). In short, if you have a vat full of boiling oil that you didn't pre-measure to include a twenty pound turkey, and you drop said turkey in, a lot of the oil is going to overflow. Boiling oil overflowing is bad; overflowing onto gas burner is usually fire-truck-and-insurance-company-call disastrous. Frying is religion here. But don't think I sneer at southern cooking even if some of it induces alarm: I grew up eating grits, bacon and eggs, the residual effect of my father's time at Ft. Benning, and weekends in Macon, Georgia with the Bone family. Few foods afford greater satisfaction than that breakfast. My Grandma Bone has been gone many years; and still I yearn for her buttermilk fried chicken. In fact, fried chicken serves as the centerpiece of a problem I used to have: whenever I went grocery shopping while hungry, I would bring home family packs of fried chicken (which I didn't even like because I preferred homemade fried chicken!). It was like a physical tic, a culinary Tourette's Syndrome; when we were dating, Hubby once opened the fridge and said, "You went shopping hungry again, didn't you?" When I tried to demur, he simply threw the door open, revealing the damning evidence. (A much more forceful reaction than the time he opened the freezer and found a ten gallon drum of green tea ice cream inside, whereupon he simply closed the door and walked away in mute stupefaction). I have a cast iron skillet that belonged to Emil's grandfather; it's been lovingly restored and seasoned for me by Hubby, ready to heat up lard and meat. But I think for this event, it's best to honor my southern surroundings and go with deep frying. Here's a favorite: Fried Soy-Sake Shrimp Wontons with Ginger Aioli. It's modified from a recipe that originally appeared in Bon Appetit.